Each vintage, from our base in Cairanne, we are able to select exceptional Grenache and Syrah from the best Côtes du Rhône Villages to make Les Coteaux, which we then enrich with classified wine from Séguret, Sablet and the cru of Cairanne. Common practice in the Côtes du Rhône is to bottle the best cuvées as a single named Village wine and the rest as basic Rhône Villages. 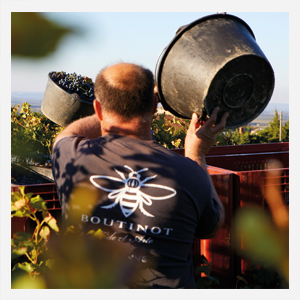 Boutinot’s philosophy, on the other hand, is to start with the intention of making the very best Côtes du Rhône Villages possible by sourcing wine from the vineyards of named villages and enriching them with a small proportion of barrel-aged wine from Sablet, Séguret & Cairanne. Boutinot Rhône 'Les Coteaux' is therefore a selection of the best Grenache Noir & Syrah from some of the 17 named Côtes du Rhône Villages. We source wine from a number of growers with exceptional terroir and so have the flexibility to select only the very best fruit each vintage (rejecting parcels which do not meet our high standards). Mostly unoaked, a small proportion (20%) is part aged for 22 months in a few new but mostly older oak barrels to bring depth and subtle notes of complexity. A delicious accompaniment to grilled meats, casseroles or a classic shepherd's pie.